Fidelity American Express is one of my favorite credit cards to use. It's kind of a boring card so it doesn't get as much attention as it deserves. In addition, there is usually no sign up bonus but it's my trusty old card that's always in my wallet and I use it to buy American Express Gift Cards as well. There are no rotating bonus categories or any special purchases. The reward is 2 points for every dollar you spend. 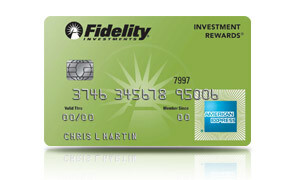 When you redeem your points into a Fidelity Account 5,000 points will equal $50 so it is a true 2% cashback credit card. Every purchase gets two points and there are no limits to how many points you can earn. Right now, you can get a $50 sign up bonus if you spend $500 in the first 60 days. If you have been thinking about this card, now is the time to get it. There has been a $75 bonus in the past, but it is very infrequent. Sign up for a Fidelity account (free with no account minimums) and then sign up for the Fidelity American Express and get yourself a great card with a sign up bonus.